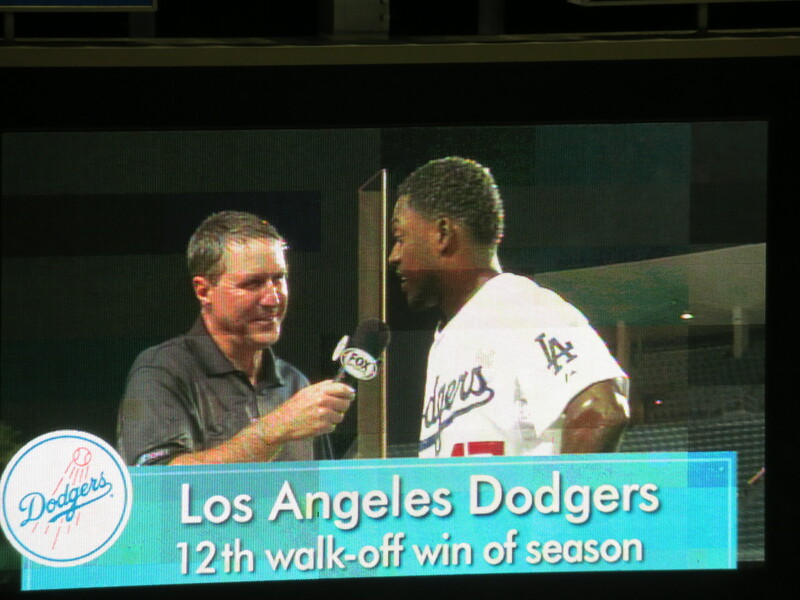 Before I post some pictures from the last game at Dodger Stadium. I want to post this one from the night before. This is Rachel and Lorena. Rachel is four years old. Rachel asked me “What are you doing?” I showed her my book and she says “Oh! you are keeping score!” Smart girl! 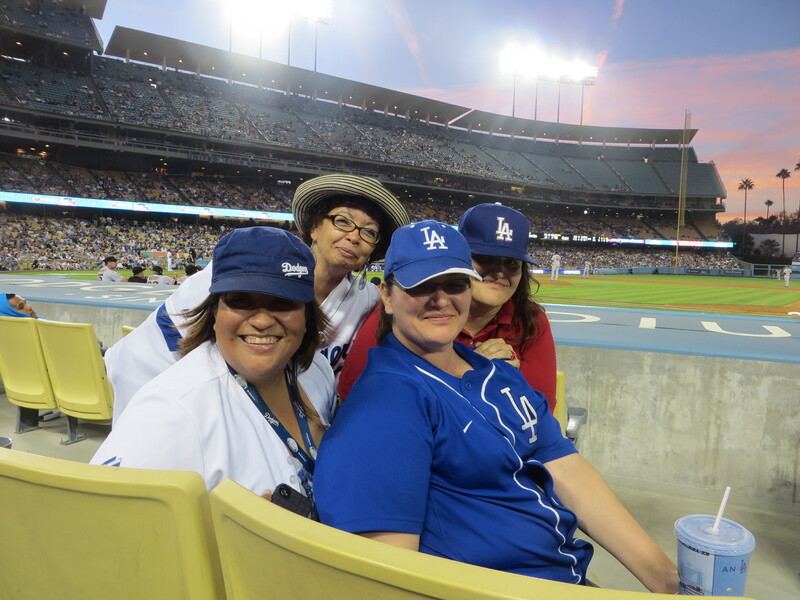 For the last game at Dodger Stadium, my friends Rosie, Iilda, Lorena and I splurged and sat in the dugout seats. Taking a picture of a Relay for Life piggy bank with Cochito Cruz in the background. My boss who is one of the leaders for the Relay for Life in Simi Valley puts one by the cafeteria cashier box so employees can donate their change to the cause. 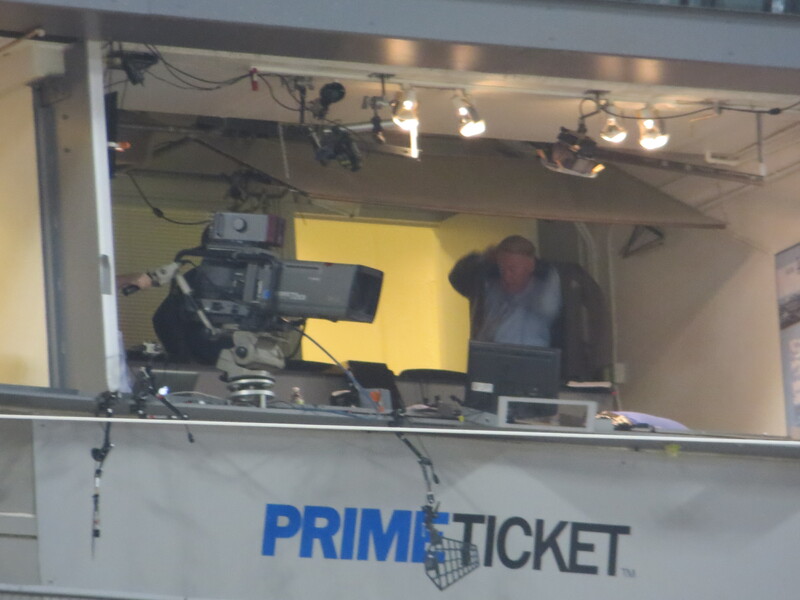 Good night Vin Scully! We Love you! 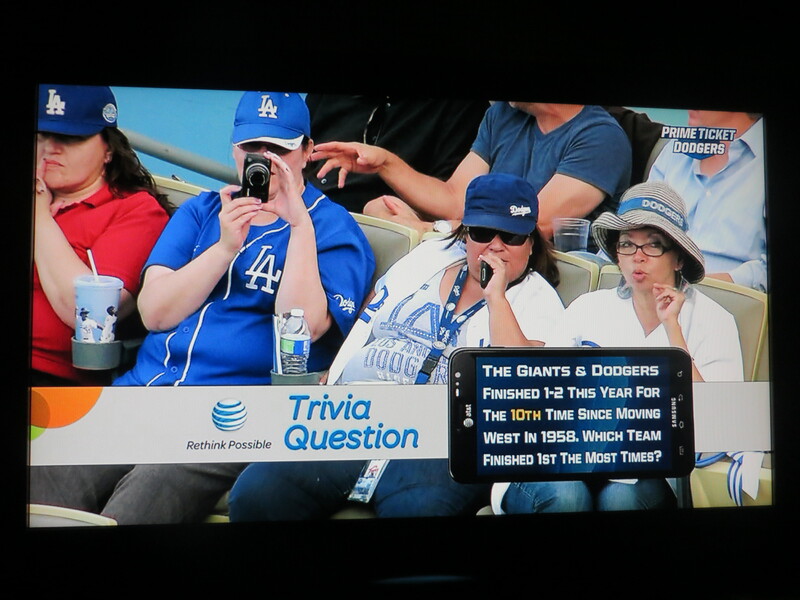 A friend of mine sent me a PM saying “Emma I was worry about you after the Dodgers got eliminated but not after googleing “Emma Dodger blue” and saw Crzblue” LOL. I am getting sad that is the next to the last game at Dodger Stadium. No matter what like Frank Sinatra’s song said “It was a good year” Dodgers have new owners and will put a good product on the field. This year my friends and I went to Spring Training for the first FanFest there. It was six women and a guy in a van. What fun hat trip was! Three of us returned to Spring Training to watch a few games. 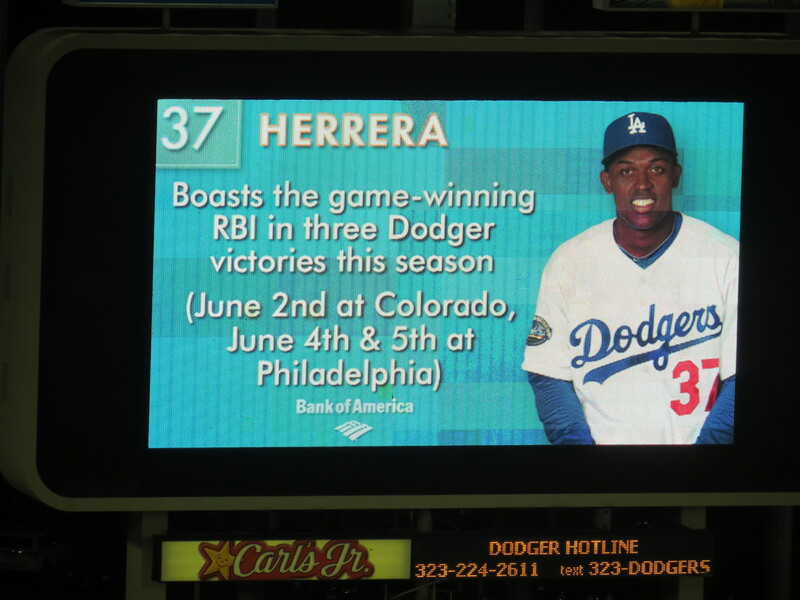 We went to the four game series in San Diego that started with Opening Day there. San Diego is always a lot of fun. Lorena, Rosie and I headed to Seattle. 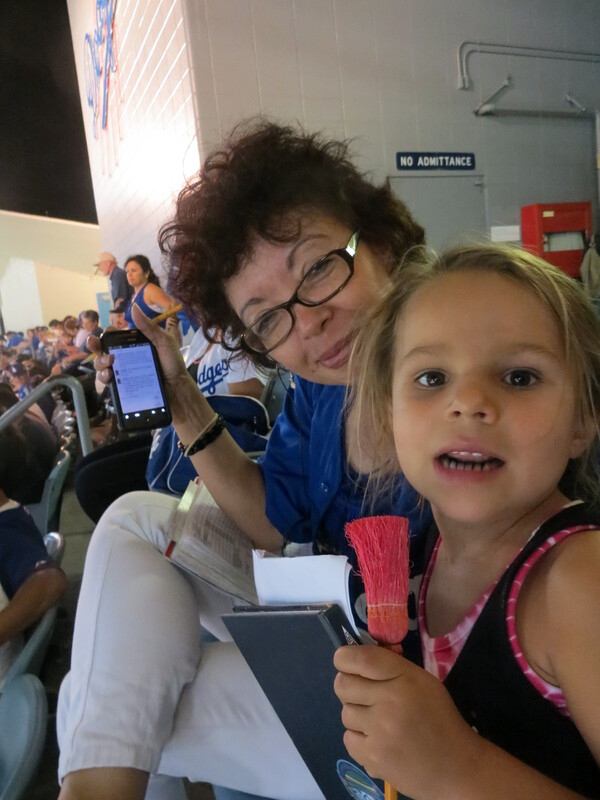 We saw the Dodgers get no hit by six pitchers but the Dodgers took the series. 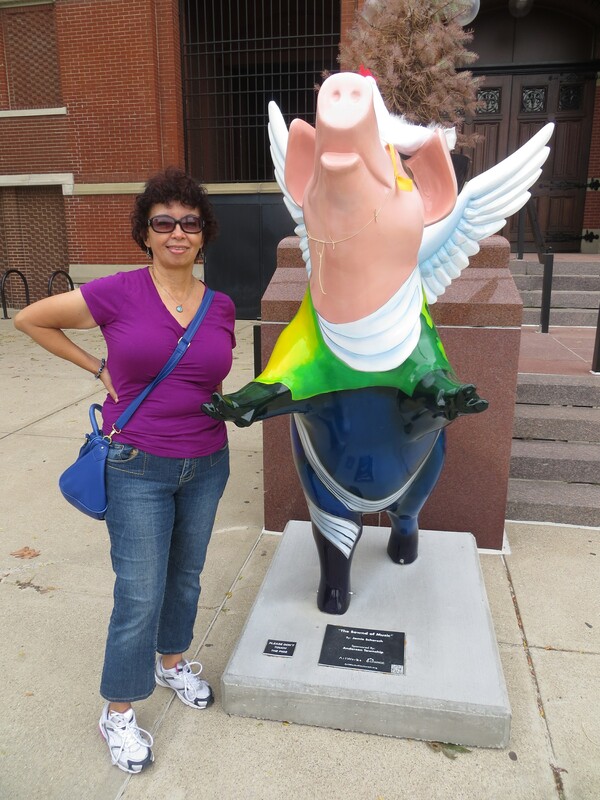 Rosie and I went to see our Bums at Cincinnati, a new stadium for the two of us. In between I went to the SABR convention in Philadelphia, haha I am thinking of next year. I meant Minnesota where I met up with more friends there and made some new ones. 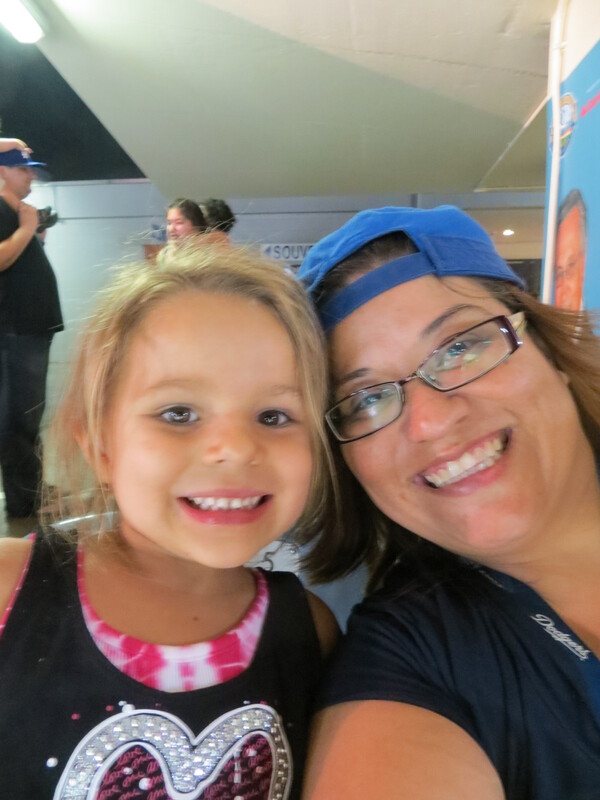 There were some frustrating losses but win or lose, we love our Boys in Blue! 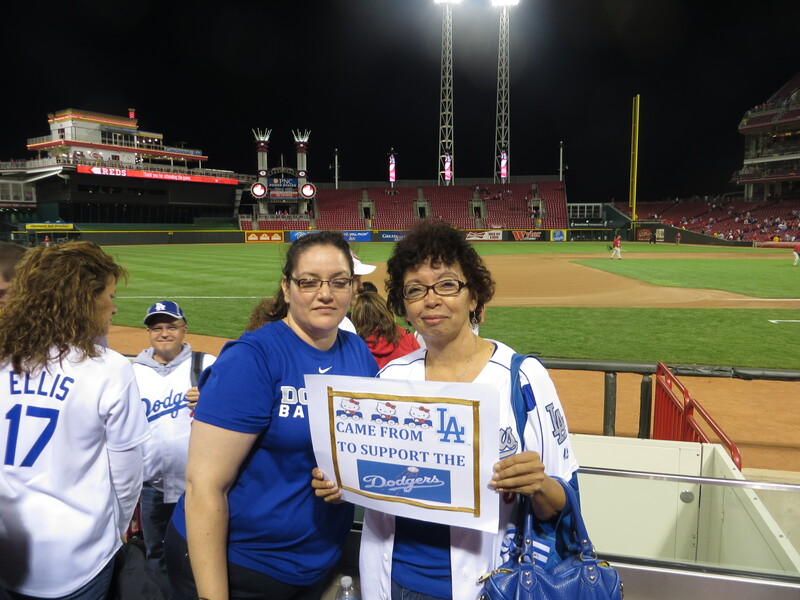 Last night Rosie, Lorena Pricilla and I were reminiscing about our road trips and hanging out at Dodger Stadium. There were more good times than bad times. Maybe I am just remembering the good times. What a fun game last night! Boys played like they are capable of playing but now they are running out of time. Here are some of my pictures from last night’s game. Some of the pictures Lorena took. Some days she just says “Give me your camera Emma” She knows I get busy keeping score and miss some pictures opportunities. I have not met Cochito Cruz yet. I don’t have his autograph or a picture with him but maybe tomorrow! Today I will be at the stadium by game time. (I hope I hope). 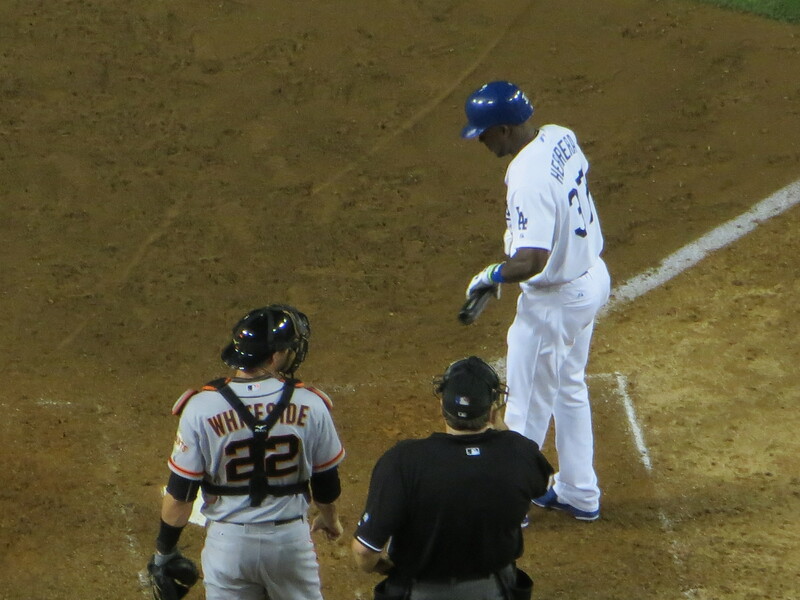 Bottom of the 9th, Herrera batting for the pitcher. Oh and prior to the game, I got interviewed by Ben Platt of MLB 🙂 for the MLB Blogs. I was a tiny little nervous. 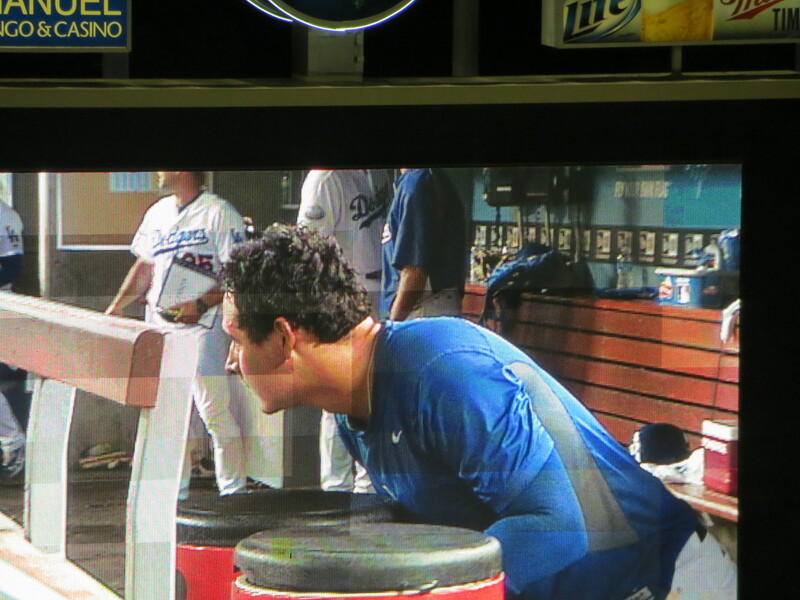 The interview took place of the Dodger Dugout. Thanks Ben!! Thanks Mark!! Let’s Go Reds! Letg’s go Dodgers! Splurging on Dugout seats for Wednesday’s game. Tomorrow Lore, Rosie, Ilda and I splurged buying dugout seats. We are going to be behind enemy lines but we will be there. 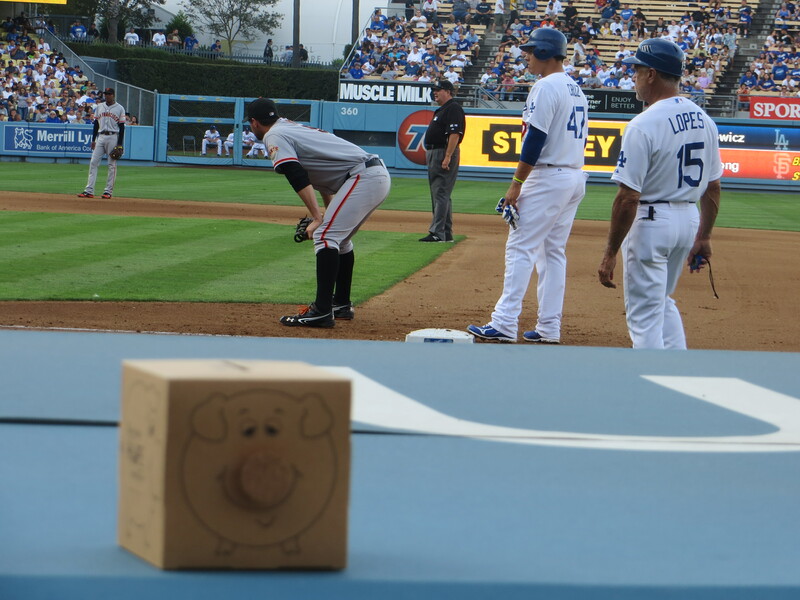 Our friend Jeanine suggested we try some Santeria, voodoo dolls to bring bad luck to the Giants. haha. 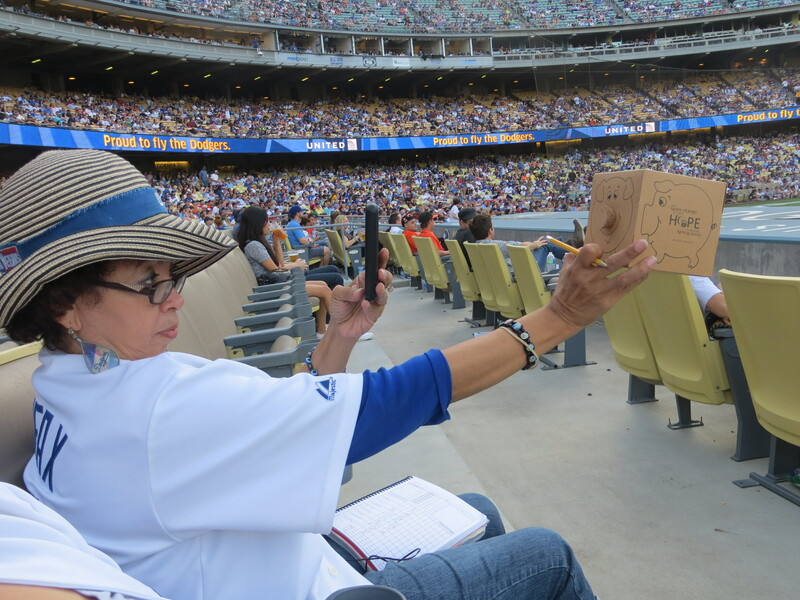 The Gran fiesta at Dodger Stadium was so crowded and a little disorganized. 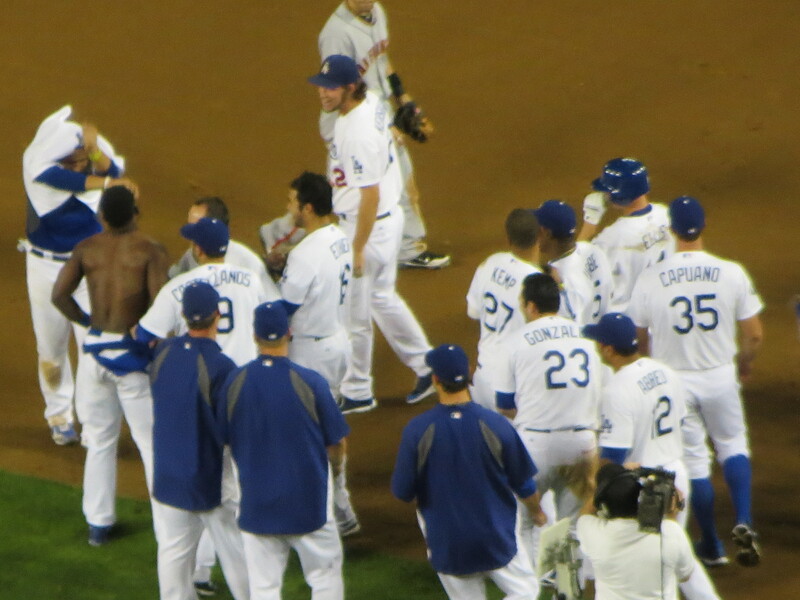 Maybe the Dodgers were not expecting that many people. They need to expand the area to accommodate the larger crowds. The lines to get in were extremely long. They checked your bags and checked that you had a ticket to the game. After you got in you had to get in line for the autographs. The lines for Cochito Cruz and Adrian Gonzales were unbelievable long. They spilled way outside. The problem was fans that were parking were just getting in line there. The security guards were not noticing that. Also I don’t understand how when we were in line outside before 1:30 at the gates by the Pasadena Freeway entrance, by the time we got out of the car the line to get in into La Gran Fiesta, the line circled around! There were also some regular fans while we were closer to get in that their bags got checked and they let them get in right away. There should have been a special line for Season Ticket holders. For us that support the team all year around. My friends and I (all of us season ticket holders) never made it to get Cochito Cruz or Adrian Gonzales. By the time we got to the table, there was someone else there. Fans were asking me who he was. It was joe Moeller. Later on someone asked me who were at the other tables. I know fans should know but you had some fairly new fans, fans that is their first time doing that. 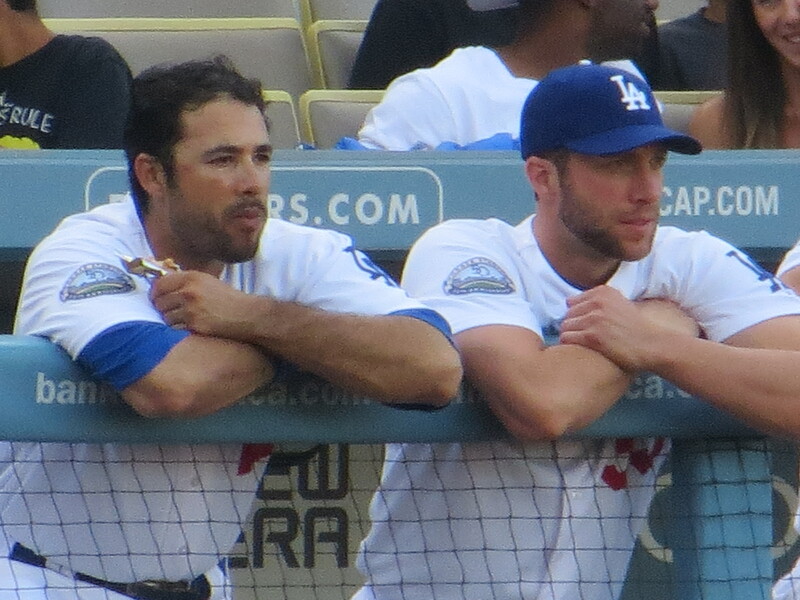 Maybe the Dodgers should have had large name tags made on the computer explaining who were sitting at the tables. I did see Pepe Yniguez. Jessica Rosales took this picture where Kenny Landreaux and Pepe were signing. Thanks Jessica! I also got Manny Mota and I showed him his picture when he was with the Houston Colts 45’s organization. Picture posted in prior blog post. 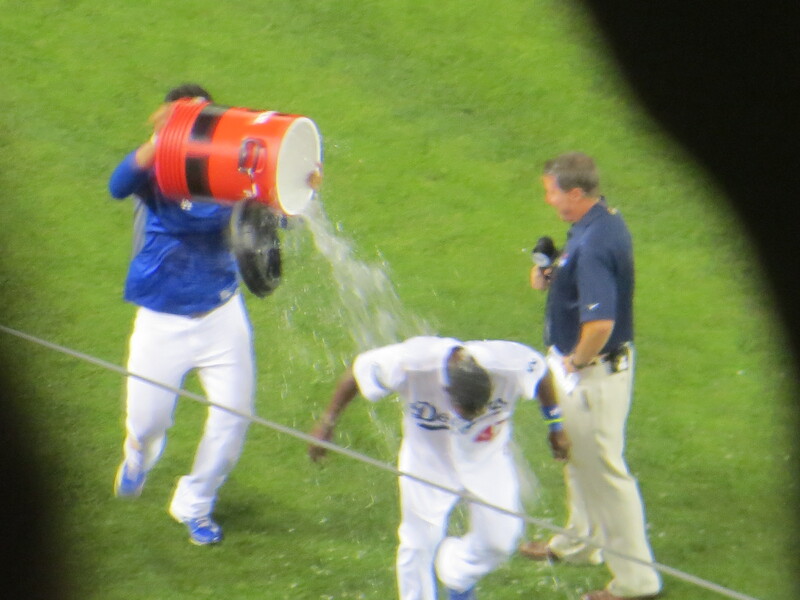 Dodgers win consecutive game with another shutout. 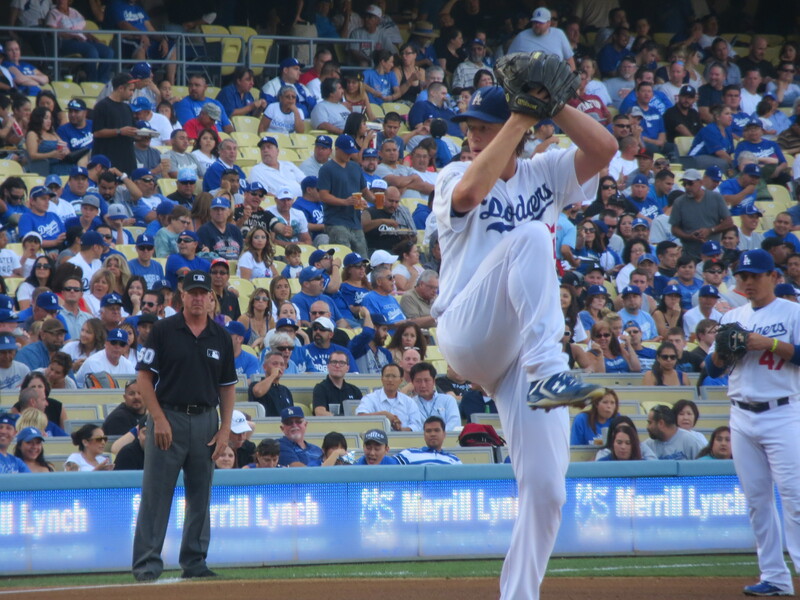 Dodgers won against the Rockies on Friday 8-0 with a great performance by Clayton Kershaw. 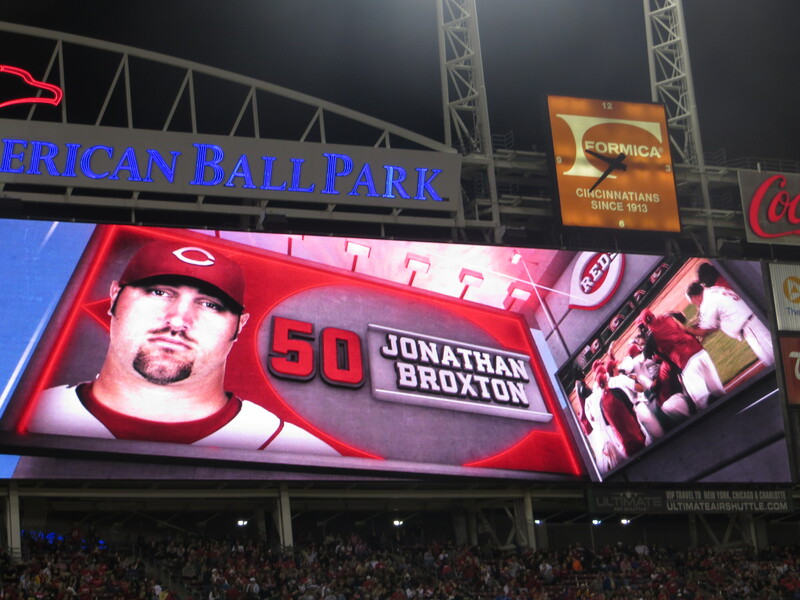 Blanton pitched a shutout on Saturday with the score of 3-0. 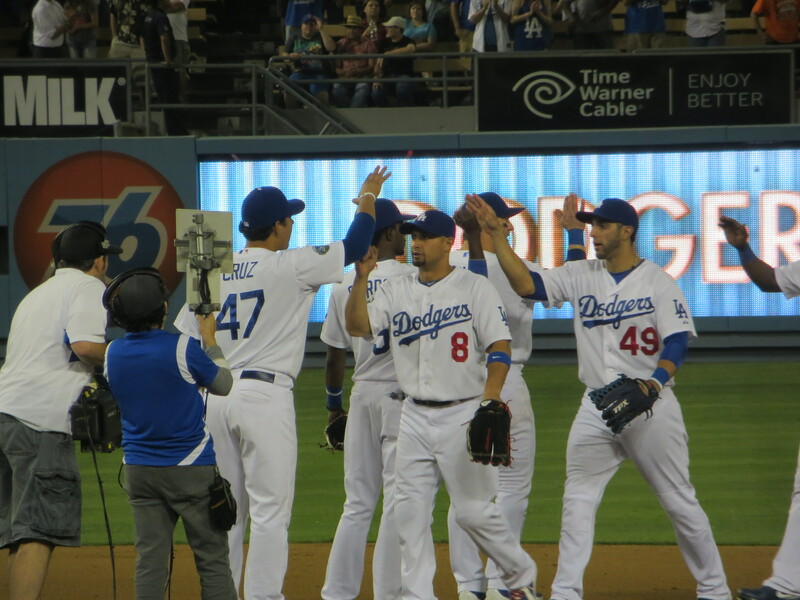 Can the Dodgers pitch another shutout? TrublueLa, Eric Stephen said that the last time the Dodgers had a shutout sweep of 3+ games was 1966, a 4-game series against the Astros. Bob Timmermann followed my question of “was this at home or on the road” with “It was at home. Osteen and Koufax had shutouts and the other two were combined efforts” Awesome! I love these two with all their knowledge! I settle for a win today no matter the score. Is amazing how many players hurt the Rockies have. 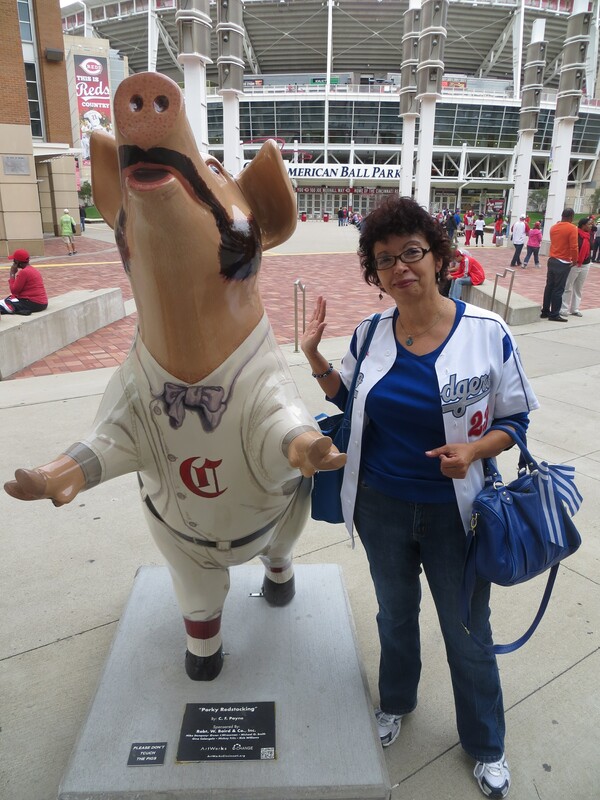 I have not looked at the records but Dodgers don’t do well on day games so like I said I just want the W. Go Dodgers! Is Fan Appreciation Day. Among the prizes are a one year lease on a car. It used to be that they gave you the car. Also there are the two season tickets. The only thing I have won thru all the years I have attended Fan Appreciation Day was a voucher for Panda Express. I am just waiting for Monday. I will explain that in my next post, but I am really excited and a little nervous about this so yes, I am just waiting for Monday! In the meantime I need to head to the stadium! Running late so no pictures until my next post. 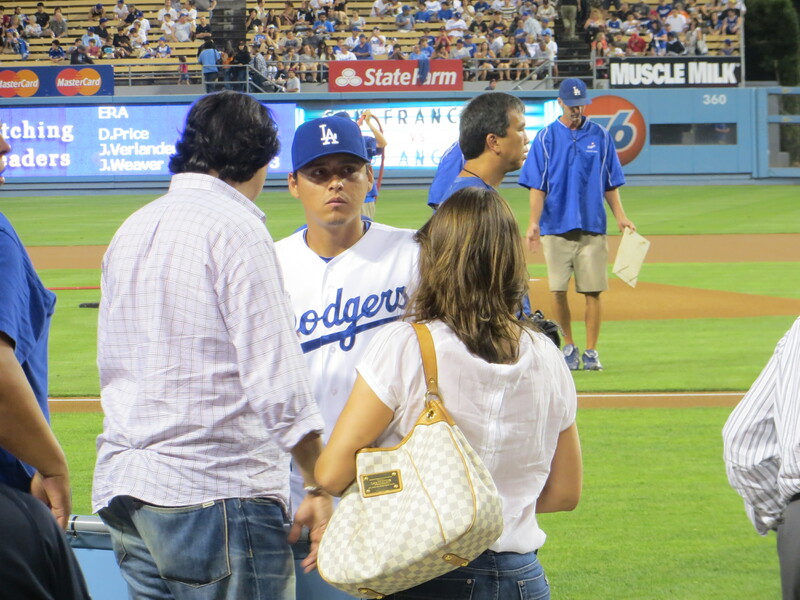 Jaime Jarrin has nicknamed Chad Billingsley Barbarroja because his beard is coming out red. 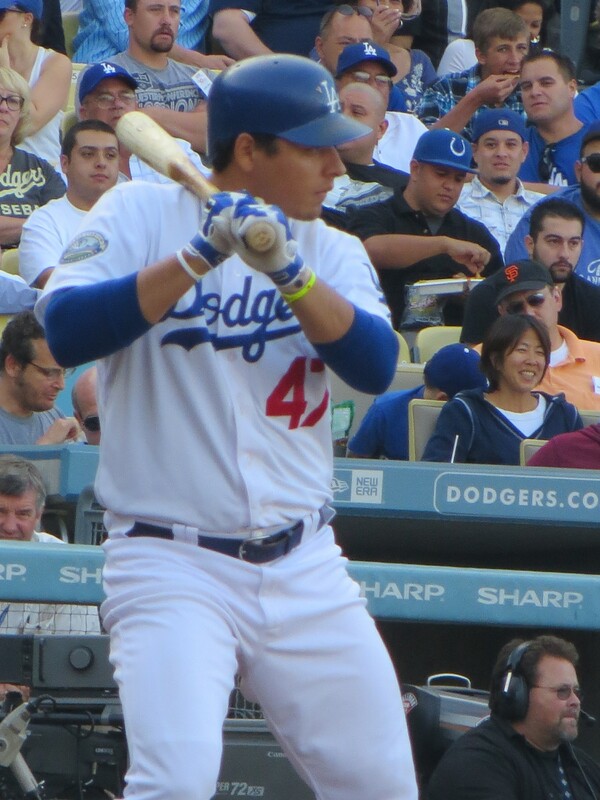 Jaime said during one of his transmission that he told Billingsley that he calls him that. Billz said he likes it. There is a Barbarroja beer in Argentina. Jaime Jarrin and Pepe Yniguez report that El Cochito Cruz talks to his dad every day about how he is doing. His dad watches him on the internet. He tells him “you did this right, you should open this way, you did this wrong. Cochito cruz Sr. used to play in the Mexican League. As I edit this Cochito Cruz just hit a homerun! 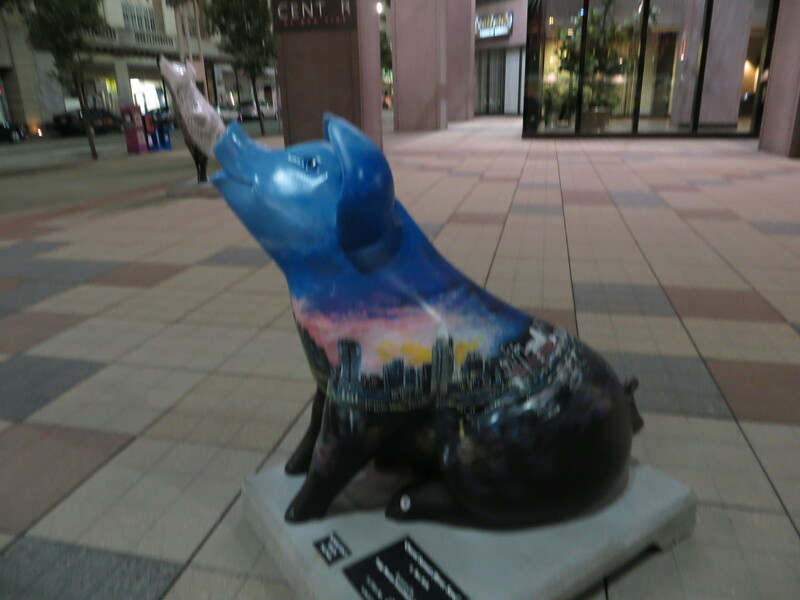 The nickname “Cochito” refers to “el Cochinito” which means a little pig. 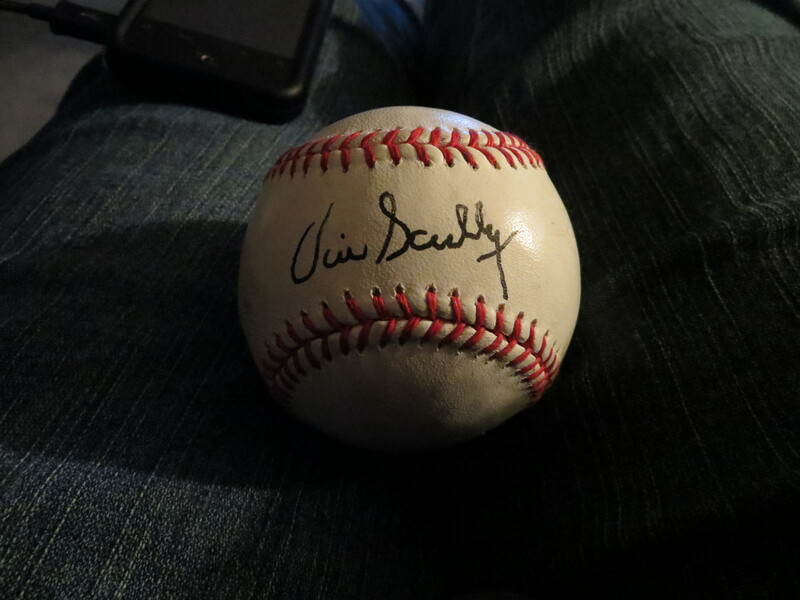 Luis Cruz Sr. was known by that last name so his son inherited the nickname. 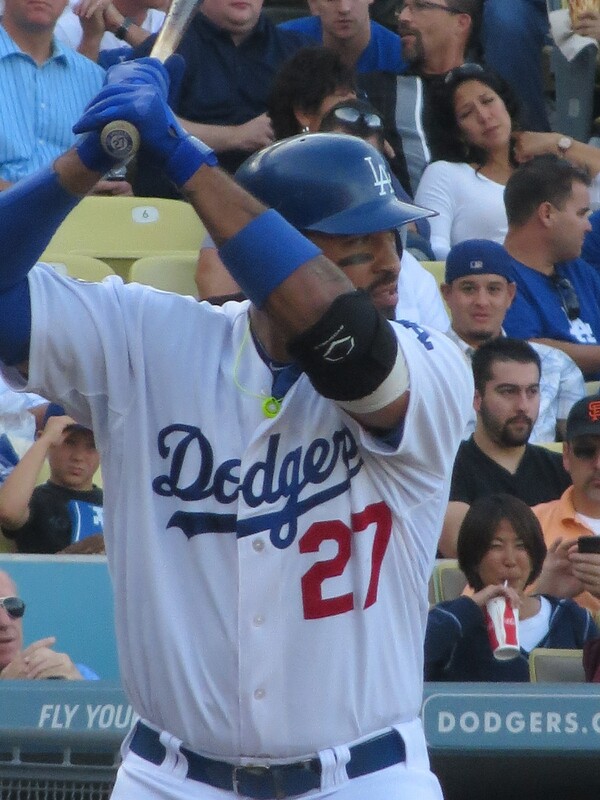 Congratulatios to the guys that hit the back to back to back Hanley Ramirez, Loney and CochitoCruz. 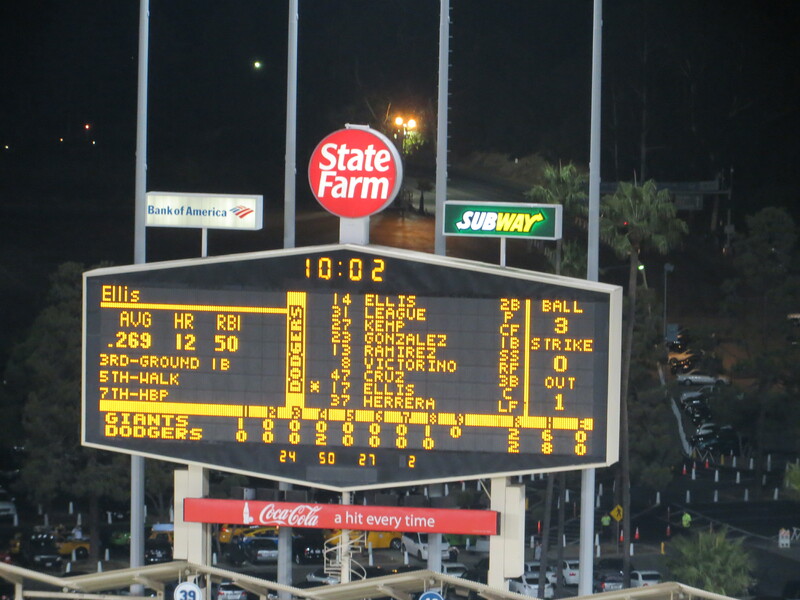 If someone had told you that there were four homeruns in the Dodger game you would have figured that Kemp and Ethier were included in there but no. 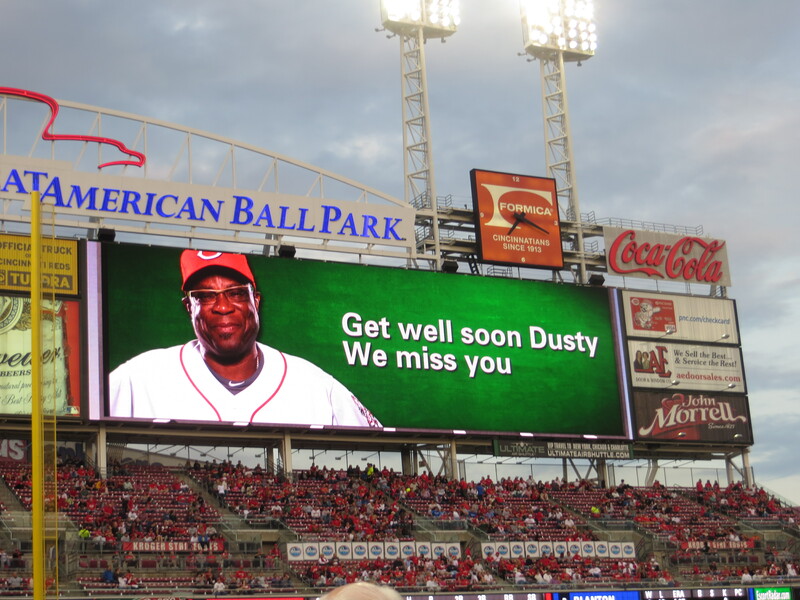 There were four hits in the game and all four were homeruns. Get away game for the Dodgers with the Braves then home to play three with the Giants. Go Dodgers!